Today's trailer for Sony's upcoming sequel The Amazing Spider-Man 2 gave us a look at a Spider-Man universe that's more in line with Sam Raimi's vision--and other superhero movies--than the comparably small-scale and personal first Amazing movie was. And, perhaps unsurprisingly given Sony's recent remarks about sequels and spinoffs, the trailer also gave us a look at a much wider universe for Spider-Man--including some teases for future films. And, of course, those things that you notice if you're a comic book reader. The first thing I noticed, which isn't really an Easter egg per se but which bears repeating, is that the trailer does not carry a "Rise of Electro" subtitled with it, as has been widely reported. Some official (or seemingly official) promotional material has featured that subtitle in the international market, but it seems as though here in the U.S., Sony either isn't going to use it or at least hasn't committed to it yet. Given the prevalence of other villains in this teaser, it kind of makes sense. Rise of Electro as a subtitle would do a disservice to the Green Goblin and Rhino. And it idea of multiple villains, and/or of being outmatched and overpowered seems important to this film...well, you can fill in the blanks. The mysterious man with a hat who appeared before The Lizard in the post-credits sequence in The Amazing Spider-Man is back--and here we have more or less confirmation that he isn't Norman Osborn, everyone's favorite pick, at the very least, since the body types are different and Osborn appears to be bed-ridden in this film. The character could be any of a number of people, and we've done some digging through the comics in the past and come out with a few good ideas--but considering the pervasive animal-themed villians in this film (even Electro apparently comes from an eel here), I'm thinking Ezekiel from the J.M. Straczynski run is your safest bet--or Morlun, the yang to Ezekiel's yin. Oh, yeah, and he's got a workshop. In the workshop where the Man with the Hat is walking around, we have...oh, crap! 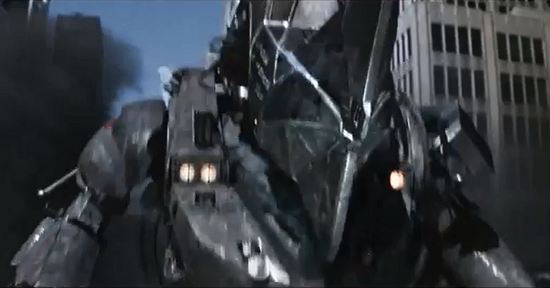 Are those The Vulture's wings and Doctor Octopus's arms? We're getting a kind of clear distinction between Osborn and Osborn here. Even though Norman apparently doesn't take to the glider himself, he's certainly pulling his son's strings to some extent. While Harry is clearly willing to do what he has to do for...well, whatever end the Goblins have in mind, which isn't yet clear from the trailer...he doesn't like the idea. "What about Peter?" 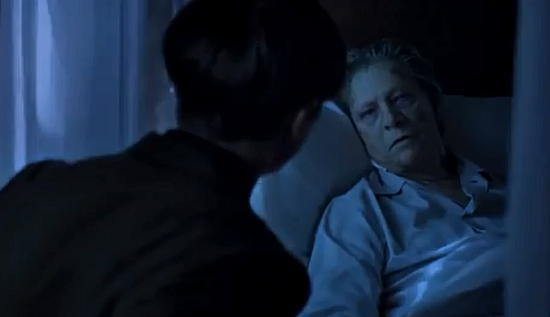 He asks of his childhood friend, only to have his father tell him that not everybody has a happy ending. As we've suspected since a version of the movie poster leaked not long ago, The Rhino in this film will join Electro as variations on the Ultimate Universe versions. Gone is the idea of a guy in tights, replaced by a hulking robo-suit with horns and plenty of menace. Apparently influenced by design elements from Pacific Rim, the Rhino suit begs the question: How do the filmmakers decide which characters are going to have biological powers rather than just toys, especially since all of it supposedly comes from Oscorp playing with animal DNA? After a notable absence from the first film, The Daily Bugle--Peter Parker's longtime employer in the comics and the Sam Raimi movies--is asserting itself a bit in this movie. The film's viral campaign is designed to look like the Bugle's Tumblr, and a sign in the background of the trailer urges New Yorkers to follow that Tumblr. Why seven? Well, it's impossible to say without seeing the movie but if we're going to work from the assumption that Oscorp has its fingers in a lot of pies, perhaps this is where the experiments are kept that lead to Spider-Man and the Sinister Six's creations? Someone with a better knowledge of Ultimate Spider-Man than me might be able to offer an alternate suggestion; it seems as though I remember seeing one of these before and being told that's where they originated. Well, that's a cute outfit, Gwen! Where did you get it? We've seen Gwen Stacy in this outfit before, haven't we? And no, not just in the paparazzi photos taken during filming. Emma Stone here is wearing the outfit Gwen was wearing in the comics when she died at the hands of Green Goblin. In the comics, she was hurled from a bridge and died when her neck snapped after Spider-Man tried to save her (this has been debated, but it's the version I like and I'm writing this, not you). 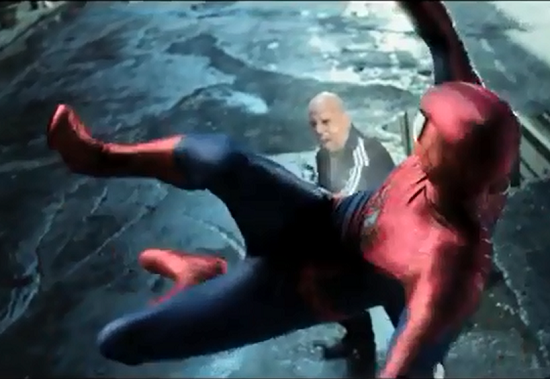 Sam Raimi's Spider-Man films bastardized that scene a little bit, with Goblin putting Mary Jane in a similar position, but MJ walked out of it alive. The fact that they staged the scene, though, makes it nearly impossible for Marc Webb to faithfully adapt Gwen's death from the comics. Is this outfit just a wink and a nod to that famous story, then, or will something really awful happen to her inside of this clock tower?